No, it's not a long-lost H.R. 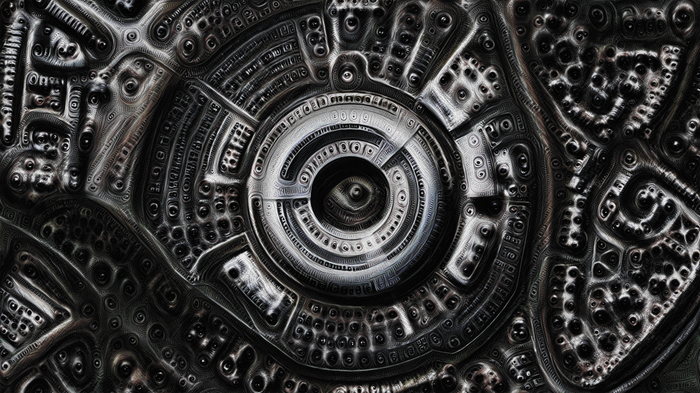 Giger work - it's a piece created using Deep Dream by artist Memo Atken titled "GCHQ'. Last year we wrote about Google's Deep Dream project, a project where they took one of the vast neural networks - essentially a digital attempt to create a learning 'brain' - that was typically used to do image recognition and inverted its processes, where instead of identifying the content of images, it generated them. The result was something out a hallucinogenic drug trip gone wrong, and so quite naturally it took the internet by storm. The appealingly viral nature of the project went into overdrive when Google allowed the algorithms to be used by the general public, who could upload their own images and photos and have the neural network "enhance" them by mapping its vaguest of suppositions of the content into the photos and reinforcing them until the final result was wildly different than the original. In the original blog post Google published unveiling the system, they explain in more detail. "This creates a feedback loop: if a cloud looks a little bit like a bird, the network will make it look more like a bird. This in turn will make the network recognize the bird even more strongly on the next pass and so forth, until a highly detailed bird appears, seemingly out of nowhere." But once it was open to the internet, artists grabbed hold and began pushing the limits of it. Sure it was fun to see your cat with a snail growing out of its head because a computer thought its ears were curly, but the really interesting results started happening when the neural networks were fed pictures of completely randomised noise (like you used to see when an old analog television wasn't receiving any channels). Suddenly, the network was dreaming entirely on its own based on what it knew. Artists could tweak this 'knowledge' and help guide the network in a certain direction, but could never completely predict what would be created. Google dubbed the style 'Inceptionism', after the famous blockbuster movie Inception, and finally at the end of this February, it received its own exhibit. Comprised of Deep Dream artworks curated and edited by a number of artists, the show was a single night of images auctioned off to support a local arts charity, and wound up raising over $84,000 for the Gray Area Foundation for the Arts. Every single image in the auction was sold!